For those moments when you need to leave your little one alone but keep your child safe, that’s where an exersaucer comes in handy. These devices are designed to offer your baby mobility and sensory skills while keeping them entertained, but the best exersaucer should also have good balance for safety. Below are some of the best exersaucers, researched and vetted for parents looking to make the right purchase for their child. 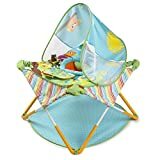 The Summer Infant Pop N’ Jump activity center is a popular one with parents for its lightweight and mobility features, weighing 13.1 pounds. Simply pop it open and set it up anywhere in the house or outside for your child to enjoy the fresh air. 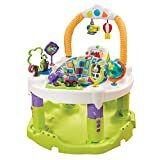 You can also transport this baby exersaucer in the car with its packaging for travel. Not only does it have a pad on the bottom to protect their delicate feet, but it also has a canopy overhead to shield your little one from the sun. According to online reviews parents enjoy this one because it’s easy when you’re on the go. In fact, according to our research, this is the best exersaucer available at the moment. They also like the convenience of washing it easily. But some reported the floor mat tore after only a few uses and it actually tipped over when their child was bouncing a lot. A lot of depth for jumping. Some parts not as durable. Not as tall as other exersaucers. The EvenFlo Jungle ExerSaucer Jump and Learn gives parents peace of mind that their little one can exercise and play in a sturdy bouncer. The exersaucer has a fun mix of toys for your baby to enjoy and allows the child to jump freely, strengthening their muscles. 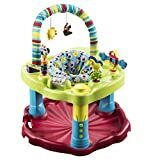 If your child loves to jump this could be the best exersaucer for them. The base helps children develop strong coordination and it sits at 22 pounds. Parents commented how their child really liked the deep bouncing effect the jump and learn provides as well as the toys. Others though remarked that it was a little too high for smaller infants who had some trouble in the beginning learning how to jump. Allows children to jump easily. Bouncer is a little high for smaller infants. Some parents reported missing toys. The EvenFlo world explorer is a fun way to get your child to explore the world through toys, lights, and music. Toys include a story pod with 12 exciting pages and the ability to play it in 4 languages with 36 stimulating sounds. Some might consider this fully interactive bouncer as one of the best exersaucers because it offers so much for their child to do. A soft mat is also available for newborns.Parents commented online they like the variety for different developmental stages of their baby’s first few years. The world explorer also has a built-in carry handle with a washable pad, weighing 20 pounds. Some parents reported that a few toys attached to the exersaucer would get loose at times. Unique features including 36 sounds in 4 languages. Offers entertainment for different developmental stages. Some parents report toys were a bit too stimulating. 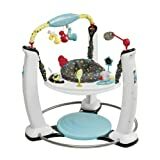 The Bright Starts exersaucer and activity center provides a seat that swirls full circle giving your baby 360 degrees of fun. 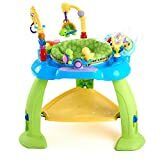 The 12 toys on the activity center encourage motor skills and it’s three-position height adjustments allows the exersaucer to grow with your baby. Parents also like the machine-washable seat. One mother remarked how her 9 months old really enjoyed the spring in the bouncer and would play for hours. Seat swivels full 360 degrees. Only a bouncer, not a walker. The EvenFlo Bouncing Barnyard ExerSaucer offers parents a safe alternative to putting them in a secure place when you need to attend to something for a moment. With its variety of age-appropriate toys it’ll help your child with crucial mobility, sensory and developmental skills. EvenFlo products are rated some of the best exersaucers in the industry. 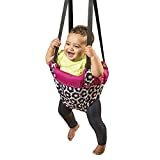 Jumping, spinning and rocking will also help your child use their important leg and back muscles.According to online reviews from verified customers, they were pleased with the ease of putting the exersaucer together and that it was sturdy for their child to play in for a while, weighing 13.3 pounds. However some complained about a few of the attached toys not providing enough stimulation for their child, and one of the exersaucer’s legs seemed a bit wobbly. Safe for the child to move around. Easy to assemble and portable. Toys don’t offer enough stimulation. Sometimes the exersaucer’s legs become loose. Tight spaces for wiping down. The EvenFlo Door Jumper Marianna is a perfect choice for infants who get too stimulated by electronics, and want to have good old fashion fun by just jumping. The door jumper is also great for small spaces, making it the best exersaucer for apartments. It only weighs 2.8 pounds. Parents liked the sturdiness of the spring for jumping, and to take it on the road. Others didn’t feel like their child fit in the jumper as comfortably as they hoped. Fits small spaces like apartments. Some parents report child does not fit comfortably. The Chicco Dance Activity Center lets your baby move and groove by allowing you to plug in your MP3 player. A locked tray keeps the electronics safely out of your child’s hands. When your baby gets tired of dancing they can easily make the switch to a stationary activity center also included on the tray. 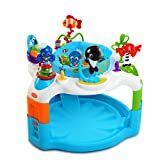 Parents who ordered this product say they like the two in one feature of music and activities for their child and the exersaucer allows their child to move across the floor with ease. They also noted its durability weighing 15.4 pounds while their little one exercises. However, some criticisms are the bumpers make it difficult for the child to use the walker and the electronics only worked for a little bit. MP3 player converts into a stationary activity center. Height can adjust at 3 settings. Bumpers have fallen off the bottom. Electronic tray didn’t last long. Recommended read: Since you’re here, you might also want to go through our collection of the best infant toys currently on the market! The fun patterns, high contrast red and black colors and neat textures will inspire your baby to have an imaginative play. All toys are designed to ignite your child’s hearing, vision and touch while getting in some fun jumping. 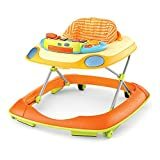 The three height adjustments allow you to custom fit the exersaucer for your baby’s comfort and it’s lightweight only 11.5 pounds.Parents say this qualifies as a best exersaucer because it’s easy to assemble, doesn’t take up a lot of space and the variety of the toys don’t disappoint. Others have noticed some of the toys will fly off if not secured tightly. Variety of toys and music. Toys can fall off easily. Some have reported it can tip easily. Offers a large variety of toys and music. Legs on the bottom don’t always lay flat. A bit high for infants. Fisher Price’s Rainforest Jumperoo is a comfortable and safe way for your baby to sit and have fun. Two soft leaves hang over like a canopy allowing your child to play with activities attached. It also features a soft rotating seat that keeps little fingers from getting stuck. Lights and music also allow your child to develop their sensory skills including a fun drum, and the addition of the sensory options makes it the best exersaucer on this list. Parents remarked how easy it is to assemble or take down and store away, weighing 15.8 pounds. Portable and be stored away. Some parents have reported it’s too low to the ground. Difficult for taller babies to jump. The activity center from Summer Infant definitely is the best exersaucer of the year, but you won’t go wrong with choosing products from EvenFlo or Bright Starts, either. 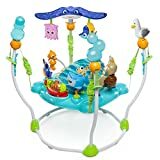 Do you have other suggestions that could be included in this top for the best exersaucer in 2018? What was your experience with these products? Finally! This article is easy for me to follow on. Not slow, not full of ads, and just looks nice, at least to me. Thanks for the love! Be sure to check out our mommy blogger Laura’s latest posts, and also our recently updated articles if you’re ever in need of new baby gear.